This Demonstration explores statistical inferences regarding the difference between two proportions of populations obeying a condition (or trait). 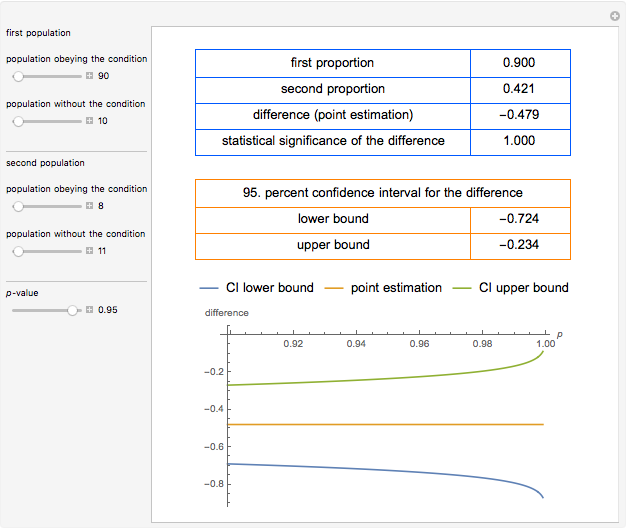 It calculates the statistical significance and the confidence intervals for the difference and plots the confidence intervals versus -value. This is done for differing populations obeying a condition or without the condition and for differing -values for the estimation of the confidence intervals. 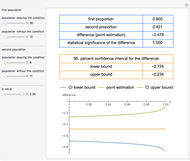 The statistical significance of the difference between the two proportions is assessed by means of the -score (or critical ratio statistic) . 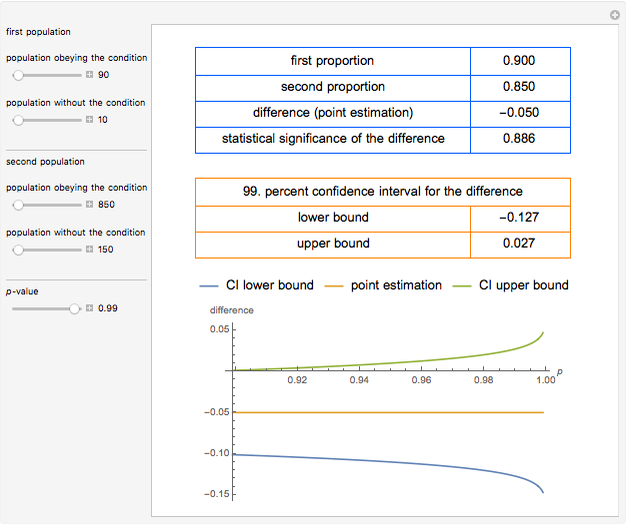 The confidence interval for the difference between the proportions is calculated as in . J. L. Fleiss, B. Levin and M. C. Paik, "Methods for Generating a Fourfold Table," Statistical Methods for Rates and Proportions, 3rd ed., Hoboken, NJ: J. Wiley, 2003 pp. 51–52. J. L. Fleiss, B. Levin and M. C. Paik, "A Simple Confidence Interval for the Difference between Two Independent Proportions," Statistical Methods for Rates and Proportions, 3rd ed., Hoboken, NJ: J. Wiley, 2003 pp. 60–61. Theodora Chatzimichail and Aristides T. Hatjimihail (Aristeidis T. Chatzimichail) "Inferences about the Difference between Two Proportions"